PRICE DRASTICALLY REDUCED - your chance to find a GREAT DEAL is here! RARE & Beautiful Remodeled Home has SEPARATE ENTRANCE to the 2 bdrm basement for IN-LAW SUITE or RENTAL INVESTMENT to help with your budget! Remodeled from top to bottom: New white kitchen cabinets with butcher block countertop & tile backsplash * All new bathrooms * New tile & wood laminate flooring * New carpet upstairs * New doors & trim...and more! Open floor plan. GREAT INCOME POTENTIAL...the basement can be accessed from kitchen door or separate outside entrance from backgate. GREAT house for someone who wants to lower their mortgage payment by renting out the basement (reduce mortgage by about $1000 a month!). OR live in the basement and rent out the main house! Basement has a mini kitchen, washer/dryer hookups, living room, 2 bedrooms, radiant heat flooring in 3/4 bath & at entry! RV/Boat parking! Private backyard & sprinkler system! No HOA. 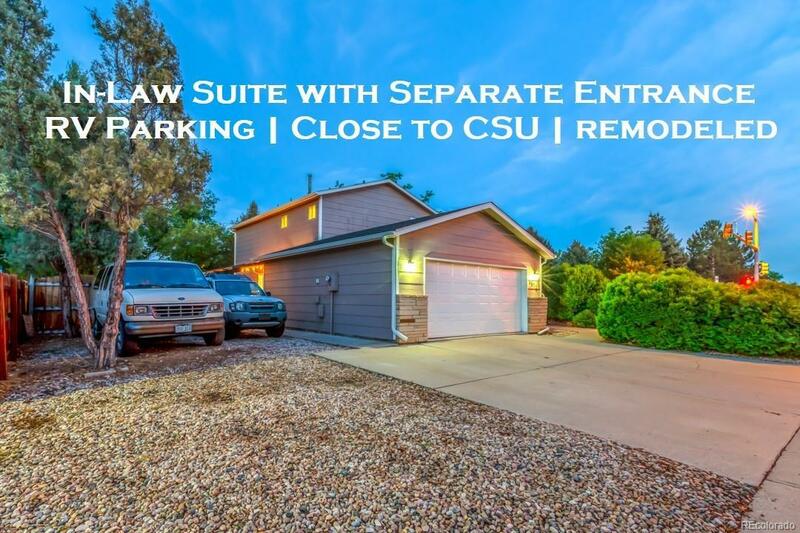 Steps from public transportation and close to shopping & CSU!